I like the interaction between Shi-on and and Doctor Pomade. It is this type of simple and innocent conversation that triggers the inner feeling of a person. I can't help but felt that Doctor Pomade is not a bad person but somewhere along the way, he started to be selfish and cold. 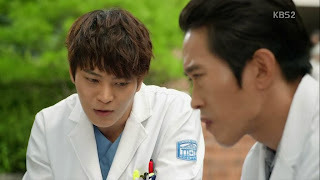 I enjoyed their conversation and i am interested in Doctor Pomade story too, such as how did he become like this and i am sure he does have the passion of a doctor. I like Shi-on non-judgmental attitude towards others and this characteristic is so pure and innocent. Shi-On uses his own ways to reach out to other people such as doctor Pomade, the opera boy and Eun-Ok. The opera boy is so pitiful and i felt that the mother should place her son health as a priority instead of planning her son route as a world class vocalist. I understand that his mother loved her son but by refusing to allow her son to go for throat operation seem to be very selfish. She is using her son to fulfill her dream and that is so cruel to her son who places a high hope for himself. Nonetheless, i am glad that his mother eventually relented and let his son go through the operation. I really hope that the operation will be successful. Eun-Ok has made some improvement and i am glad that she encouraged the opera boy. I remembered Eun-Ok loved the angelic voice of the opera boy and is glad to see him visiting her. I am guessing the wish that the opera boy wants her mother to fulfill for him after the operation has got something to do with Eun-Ok.